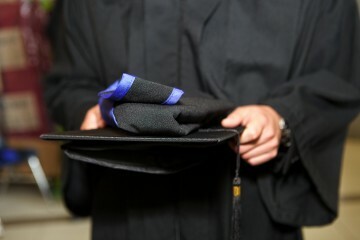 The gowns, hoods and mortarboards worn by faculty and graduating students at the graduation ceremonies evolved from clothes worn by European scholars in the 12th century to authenticate degrees. The University of British Columbia has taken pride in continuing this tradition since our first ceremony in 1916. Rent your graduation hood and gown online in advance of your ceremonies online through the UBC Bookstore. If you missed the online gown rental deadline, don’t panic. You can rent regalia on the day of your ceremony by going to the 2nd Floor of the Fipke Atrium 90 minutes before the ceremony start time. The cost for on-site rental is $70.00 for all graduates. Cash, MasterCard, VISA, AMEX, and debit payments are accepted. You will have to fill out a form, pay, and then they will give you a gown, hood, and hat. Your mortarboard cap will be given to you on your graduation day at the gown pick-up location. Caps are yours to keep as a souvenir. 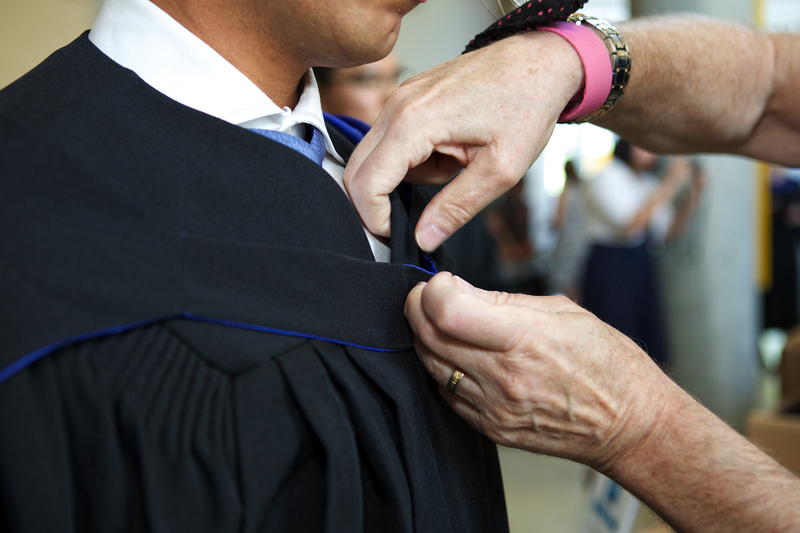 At UBC (Vancouver and Okanagan), we have regalia guidelines which say that all students must wear an academic gown and hood when crossing the stage at graduation. Any form of traditional attire may be worn underneath the gown. However, if an Aboriginal student wants to wear their traditional regalia in place of the academic gown and hat, they are welcome to do so. They do not have to wear the gown but they must have the hood, the colour and style of which acknowledges the academic degree they have just earned. The hood can be worn either over their regalia or draped over their left arm. Undergraduates and Masters students are hooded in the robing room (where they line up to process) and wear their hood onto the stage. In the case of the PhD candidates, they should carry the hood over their arm and be prepared to be hooded on stage by the President. The hood is the recognition of the student’s achievement and success and the only time that they will ever acknowledge this particular achievement so it is an important part of the academic tradition. Individual hoods (without gowns) cannot currently be booked through the online booking system but hoods can be rented for $15 on the day in the Fipke Atrium and can be paid for by cash, credit or debit. Congratulations again and we look forward to celebrating all our students. Please arrive at the Fipke Centre (2nd Floor) 1 hour and 30 minutes before your ceremony. Once you arrive, you will be given your gown, hood, and hat, and then will remain in the Fipke Centre foyer to receive instructions for your ceremony. You will then leave the Fipke Centre and process into the gymnasium with your classmates. Please note: no coat check or storage is available in the Fipke Centre so please leave all jackets and bags with your family/friends or in your car. You will be not returning there after your ceremony. After your ceremony is over (you have about an hour after the end of your ceremony to take photos), please return your gown to the Okanagan Bookstore. For more information: please visit the UBC Bookstore’s Graduation website.